Malaysian Prime Minister Najib Razak dealth rebuke in polls, losing two out of three by-elections to the opposition coalition, Pakatan Rakyat. 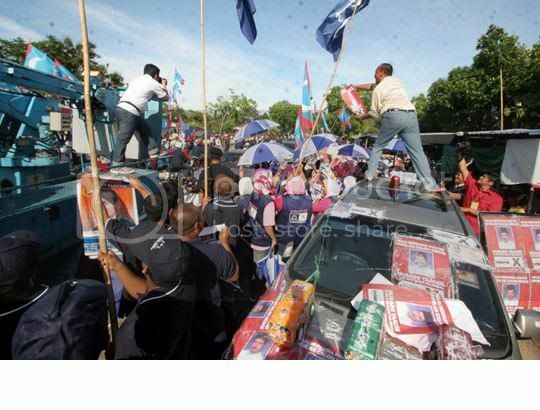 KUALA LUMPUR, April 7 — Wounded from losing Perak, Pakatan Rakyat fought back with greater ferocity to retain both Bukit Gantang and Bukit Selambau with bigger majorities, reinforcing a two-party concept and striking a blow to new Prime Minister Datuk Seri Najib Razak’s “One Malaysia” idea. Najib’s ruling Barisan Nasional kept the Batang Air state seat in Sarawak with a bigger majority but the results laid bare the lie that its Election 2008 defeat was due to former Prime Minister Tun Abdullah Ahmad Badawi’s weak leadership. Ironically, Abdullah’s trenchant critic and predecessor Tun Dr Mahathir Mohamad campaigned vigorously yesterday for Barisan Nasional in both Bukit Gantang and Bukit Selambau and endorsed Najib as a better leader for the country’s future. The people in Peninsular Malaysia decided otherwise, with Bukit Gantang giving PAS candidate Datuk Seri Mohammad Nizar Jamaluddin a higher majority of 2,789 votes in what was seen as a referendum of BN’s putsch in Perak when it ousted the popular mentri besar. Far from being a washed-up has been politician known for defying a state Ruler, the Pasir Panjang state assemblyman will now have a national stage to fight his cause apart from increasing the Pakatan Rakyat numbers to 82 in Parliament.